On Friday night we sit in Istanbul, Carterton’s wonderful answer to good cuisine, twiddling thumbs as Illona, Amanda, Richard and I consider alternatives. It’ll be raining soon, and more importantly it’ll be very windy. Our first plan isn’t exactly likely to work. 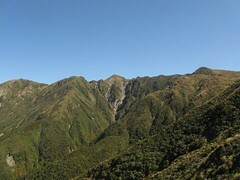 We’d planned to walk up over Herepai onto the Tararuas Main Range, south to Dundas Hut and then come back over to Cattle Ridge Hut for Saturday night. It’s a nice loop, but it would have us above the bush-line in a very exposed place on Saturday, during which time the met-service tells us will probably be hopelessly exposed to gale-force southerlies. 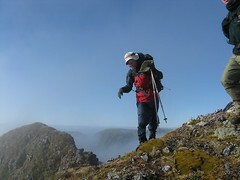 There certainly could be better things to do than spend time on the Tararuas’ Main Range. I munch away on a large mixed kebab; very filling, slightly messy but I get away with it. By now, we’re narrowing down some ideas. Over Holdsworth to Neill Forks might be worth doing in dodgy weather, and it’s near the top of the list. Looking more closely at the forecast though, it seems as if things may become more bearable late on Saturday. From somewhere an idea dawns that we could do what we originally planned in reverse, and it seems better and better the more we think about it. Getting over Cattle Ridge on Saturday with its reputation of exposure to wind could be a problem, but maybe it’s worth a try all the same. There are really only a few hundred metres to cross over the top before heading down the other side. Mmmm, sleep would be nice. Location: Tararua Forest Park, Putara road-end. People: Illona, Amanda, Richard and me. 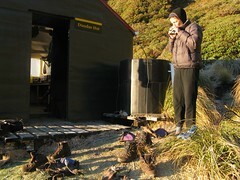 Huts visited: Herepai Hut (1 night), Roaring Stag Lodge (0 nights), Cattle Ridge Hut (0 nights), Dundas Hut (1 night). Route: From the Putara Road End to Herepai Hut for Friday night. Then past Roaring Stag, up and over Cattle Ridge, down to cross the Ruamahanga River, then up to Dundas Hut for Saturday night. 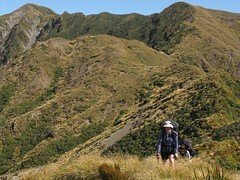 Over Pukemoremore to West Peak, East Peak, Ruapae and Herepai, then down past Herepai Hut back to the Putara Road End. Sometimes I wonder what I’m getting myself in for, but it usually pays off. One way or another, I’ll enjoy it or enjoy the end of it. Besides, as long as good decisions are made between points of safety, bad weather tramping lets you see places in a way that’s often missed. It really is raining by the time we roll up to the end of Putara Road at 8.30pm, gateway to such fascinating places as Roaring Stag Lodge and Herepai Hut. Thankfully nobody wants to camp in this, so we’ll be walking for a while to avoid it. Two large vehicles are parked at the road, which look distinctly like the types that would belong to people who’d more likely be at Roaring Stag, fitting nicely with our plan to instead walk to Herepai Hut in the other direction. It’ll mean doubling back tomorrow, but Herepai’s also closer, and we want sleep, or I do. After some time we cross the long swing bridge over the Mangatainoka River, and after that there’s about 400 metres of walking mostly up-hill. Trudging up the muddy track by torchlight isn’t the most riveting experience, but at least there’s some drying out to look forward to, and it usually pays off. Right now it’s just raining and cold. 2 hours after leaving, when we do reach Herepai, it’s a happy relief to find it empty, so we’re not be disturbing anyone. Unpacking and hanging things up doesn’t take long, not to imply that many things ever actually do dry out but sometimes it’s good to feel as if you’re doing something useful. With a quick assessment, we resolve we’d like to be away by 7am, meaning a wake-up call at 6. Seven hours of sleep will really help, and I slink into my nice comfy sleeping bag as the sole occupant of the top platform. Rain pounds on the roof for most of the night. Every so often a strong gust of wind rustles surrounding trees, but that’s all outside. With luck it’ll stop some time tomorrow morning, and in anticipation of the wind also dying down, we’re looking forward to a good weekend. For some reason Illona’s alarm goes off at ten to six. This is ten minutes earlier than advertised and she probably planned it. I can hear everyone rummaging around below, but really can’t pull myself out of bed. The deal I’d made with my brain was for 6am, and until then it isn’t going to help me at all. Eventually the clock ticks over, though, and I slide down, slip on some crocs and look outside. 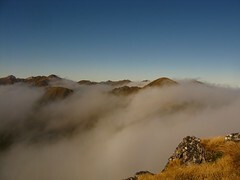 Part of the main range is visible within the dingy lurking cloud, a thinnish layer of icy snow settled on the area between East Peak and Ruapae. It’s still raining, still windy at the top, and I’m very glad we decided not to head straight up this morning. Illona and Richard preparing to leave. Thankfully due to people more organised than myself, the billy’s boiled, and a quickly mixed hot brekkie helps. Before 7am, we’re fully packed, have latched the door, and commence wading through the track that’s become much more boggy overnight. It’s getting warmer with the walking and, even better, the barometer readings imply the weather has improved from the previous night. Shame about the rain. I suppose one of the things easiest to notice about the route we’ve chosen is the excessive up and down. It starts with a climb of about 500 metres up to Herepai Hut (which we’d done on Friday night), followed by a drop of about the same amount down to Roaring Stag Lodge on the banks of the Ruamahanga River, which we’re now doing. A little demoralising in some respects given what’s to come. 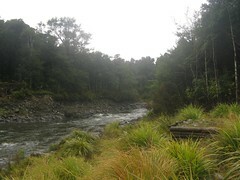 Roaring Stag Lodge is in a nice place on the banks of the Ruamahanga River, and it’s a good site for a hut. As we arrive at about 8.30am, we’re greeted by two lively and enthusiastic hunting dogs, supervised by three guys preparing to leave for the day. As they head off back up in the direction we’d come from, we take off a layer because it was getting hot. It’s still raining, though. From Roaring Stag Lodge, we cross the long swing bridge over the Ruamahanga River to the base of Cattle Ridge, and begin climbing. Despite having climbed about 500 metres on Friday night (and dropped the same amount earlier this morning), getting up to Cattle Ridge Hut is the first big climb, straight up from around 450 metres to about 1150 metres where the hut is placed. We lose the track momentarily within the trees on the way up and have to sidle around some slippery soil, but otherwise it’s a fairly standard up-hill Tararua track. The rain is less noticeable under trees, and by the time we reach the bush-line it’s finally stopped, thankfully consistent with our most recent weather forecast. In fact, there are even traces of blue sky phasing in and out. Now we only need to contend with a freezing breeze whenever we’re exposed. There’s a wide landscape below, straight down to Roaring Stag Lodge which is directly visible for most of the climb, and right until the track curves over the top of the ridge to where Cattle Ridge Hut sits, just above a murky tarn. The two huts are only separated by 2km on a flat map, but there’s around 700 vertical metres of climbing in that 2 km, which makes it feel further. Richard outside Cattle Ridge Hut. 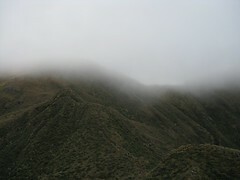 We reach Cattle Ridge Hut at 10.30am, having coasted into the base of some of the lower clouds, and stop for a very early lunch. Flipping through the hut book, we also discover we aren’t the first people to pass through for the day. In fact, a group of three apparently crazy guys have been through at 8.30am, roughly the same time we’d been at Roaring Stag, with the intent of walking our entire weekend circuit back out past Herepai before the end of today. This seems very ambitious, not solely because they’re doing it in a single day (which seems feasible for a very fit person), but because they’re doing it on this specific day with gale-force southerlies forecast for much of the time, which seems potentially very miserable compared with what they might get a day later. Perhaps their schedule is restricted. Anyway, as long as the make good decisions they’ll be fine, and perhaps we’ll see them at Dundas Hut if they decide not to go beyond. Looking at how freezing, windy and clagged in it still is on the main range and with the knowledge it’s likely to stay that way, it isn’t exactly something that would appeal to me right now. Cattle Ridge Hut is more run down than what I remember from 18 months before, but still perfectly adequate. The hut is (I think) being considered for removal thanks to its close proximity to the much more modern Roaring Stag Lodge below, despite the vertical distance between the two. The stove was removed a while back (since there isn’t much dead firewood above the bush-line). For better or worse, a 44 gallon drum which a tramping entrepreneur had last-time left at the hut with instructions about how to use it as a replacement stove has now also been removed. Furthermore on a similar theme, Cattle Ridge Hut is one of the huts that had a bunk removed as a victim of the unfortunate fire exit technicality that affected DOC 18 months ago. 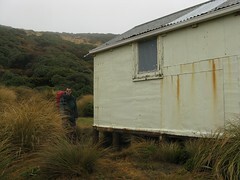 Even though the bureaucracy is sorted thanks to some emergency negotiations with New Zealand’s Department of Building and Housing (which administers building regulations), Cattle Ridge Hut is still down to five bunks as a reminder of the confusing ways that governments can work. If anything, the missing top bunk does mean there’s more space to sit down for lunch without having to bend forwards. After our 45 minute early lunch stop, we finally leave Cattle Ridge Hut at around 11.15am, venturing back out into the frozen and murky tops. Cattle Ridge is notorious for wind, being very exposed to the freezing southerly and sou-easterly that’s occurring right now. We follow the network of cairns and, eventually, marker poles, which lead to the route down the western side — fortunately despite the wind, it’s not clagged in so we don’t need to be as concerned about navigation. I’m really glad we have full storm gear for this part, even though it’s only a few hundred metres over the top before we shimmy over the ridge. There’s a very icy wind chill, despite the wind not being uncomfortably strong to stand in. Rounding an inconspicuous corner, however, the wind is suddenly gone, and we’re at the top of the small scree gut (perhaps 50 metres down) that marks the beginning of the descent. It’s not a tricky scree gut and has a lot growing on it, so with the usual care it’s quite easy to get down as these things go. Alpine plants are fantastically trustworthy for how solidly rooted they are. As we glance over to the main range from near the top of Cattle Ridge, we can see Dundas Hut murmuring in the distance, perched near the top of a baby spur that’s set back between the two more mammoth ridge/spurs that come off Logan and Pukemoremore to either side. Dundas Hut itself is coming and going at about the level of the clouds, and it’s nice to finally be able to see our destination for the night. It’s only a shame there’s a 600 hundred metre vertical drop between here and there. on the western side of Cattle Ridge. The track down the south-western side of Cattle Ridge is fairly steep, but (again) typical and easy enough to get alllll the way down. After walking 2 horizontal kilometres and a 600 vertical metres, at 12.30pm we’re deposited, once again, at the Ruamahanga River — apparently a river we can’t leave behind. This is a higher section of the same thing, which flows all the way around the end of Cattle Ridge before turning back on the far side past Roaring Stag Lodge where we’ve just been. I’m assured that for some reason it makes more sense to climb over the top of Cattle Ridge and go all the way down the other side, however, rather than follow the river. By now it’s actually quite sunny, and Illona’s decided to try and climb the social ladder by offering around some biscuits she brought. They’re quite yummy. Amanda points out that we’re now within the inner reaches of the range. With the rain overnight and earlier in the day, it shouldn’t be too surprising that the river’s flowing higher than usual. It’s not flooded, but certainly thigh-deep, flowing quite fast, tricky to stand in with any stability, and without many options up or down-stream for finding optimal places to cross. In its current state, it’s a good candidate for a technical river crossing, and carrying this out is actually quite a fulfilling exercise. Unlike some other occasions in which I’ve been involved, we actually talk to each other and reach a consensus about all the details of which method we’re going to use before we begin. This is a very positive thing, since so many people have so many different ideas about the “correct” way to cross a river, that multiple times in the past I’ve found we’ve made it part-way through a river only to find people trying to do different things. All lined up perfectly, gripping hip-belts behind each other’s backs, we carefully nudge our way into the Ruamahanga River, staying lined up well to minimise the surface area visible to the current, and it’s working really well. Half way through, I’m starting to think that this is probably the most successful technical river crossing I’ve ever been involved in (not much of a challenge, I’m afraid). I’m busy boasting to everyone about this, and perhaps it’s my emotively flailing arms that push Richard into a big rock on the river floor, causing him to stumble slightly up to his waist. I feel some mild responsibility which I mostly keep quiet about, but no matter. It’s still the most successful technical crossing I’ve ever been involved in. We pause for another snack on the far side, then at 1pm we climb up into the sidling track (about 100 metres above where we’ve left the river) that follows around the edge of the spur off Pukemoremore, then to the base of the baby Dundas Hut spur we could see earlier. This track seems fairly damaged in a few places. It never feels unsafe, but it’s narrow in places and on at least a couple of occasions, large trees have fallen and require awkward and creative circumventions. It’s uncharacteristic of the sorts of tracks we’ve seen so far during the weekend. At the base of the spur is the confluence where the two side-creeks meet having come down the gulleys on either side, we pause for yet another snack, and it’s up-hill to Dundas Hut on the main range. 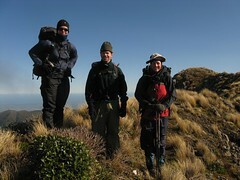 at the base of the Dundas Hut spur. This will be the final climb of the day, and it’s another 600 metres more or less straight up. At least it’s a completely honest spur, with no messing around and undulating. 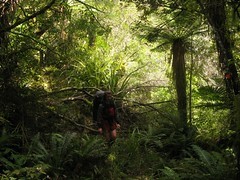 Within 30 minutes we’re back above the bush-line, and the surrounding environment is impressive to take in. We’re well sheltered from the sou-easterly by the two massive spurs on either side, which means it’s a quiet and calm atmosphere for most of the way up. The creeks on either side of the spur are loud and easily audible, but it’s funny to only be able to hear one at a time, alternating as the track up the spur alternates from side to side, as little as a couple of metres either way. At 3pm, the spur flattens out slightly, for a short while, just before the final climb up to the perch above Dundas Hut, and 15 minutes later we finally reach the sign which diverts traffic bound for Dundas Hut down to the right, off the spur. Sure enough, Dundas Hut is lurking in the hazy depths below, and within 10 minutes we’re sitting inside. It’s surprisingly warm, given the air temperature outside and the lack of insulation. Perhaps there’s been an unlikely coincidence of sunshine coming through the skylight and warming the inside of the hut at about this time of day, or perhaps we’re imaging it. Amanda pegs her socks outside on one of the metal cables that anchors Dundas Hut to the ground, perhaps in the hope they’ll dry in the remaining sunshine and wind. Nobody else is quite so enthusiastic. Looking up to the main range, no longer far above us, the clouds are shifting quickly in the air, but we’re well sheltered down here. We were curious if those three guys might have stopped here for the night rather than continue their circuit, but they haven’t, and in fact they’ve written in the book that they passed through for lunch. They must have been having an “interesting” day, and they’re most likely still going. Tonight, however, we’re focused on preparing to stay the night. Illona’s planned a very nice Soba Satay noodle meal with a ginger cake dessert. Tramping dinners can be fantastic when they’re well planned and with the food divided, and this is no exception. The late afternoon dwindles as I’m scrubbing the plates outside the front door. 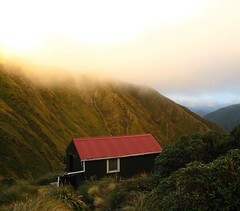 We have a colourfully muted sunset with lazy clouds dangling around Pukemoremore and its spur off the main range behind the hut. As time goes on, the cloud movement above the range slows down, thankfully as was forecast, and hopefully to stay that way for tomorrow. It’s getting cold, though, and as the sun drops to the west we’re spending more time in sleeping bags for warmth. Dundas Hut survived the 6th-bunk-purge that had affected Cattle Ridge, but the redundant wood-stove that was once here is long gone, evidenced only by the nailed covers on the floor and ceiling, and therefore there’s no extra heating. I am, once again, on a top bunk, and Dundas Hut as with some other smaller huts, has special rules which state that those in top bunks aren’t allowed to sit upright. To ensure of this, the designers instituted a cunning system of ceiling support beams that lie in strategic places relative to the bunks. At first it makes climbing into the top bunk a challenge, but one is rewarded with a satisfying feeling once it’s completed, and therefore it’s well worthwhile. Obviously more huts and bunks should be designed like this, not because I want to use them all the time, but because I think it adds to the tramping experience. Grrrr, this means I’ll have to get up, even though “I bet it’s not frozen in the morning.” All the same I unzip my sleeping bag, pull myself out of my liner, roll over and fall to the floor in a semi-controlled fashion, then rummage around to find my water bottles. Richard’s doing something similar, and Illona’s pretending to be asleep, perhaps having already been through all of this while I wasn’t paying attention. 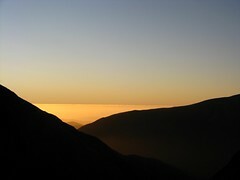 I hop outside onto the freezing deck in bare feet to fill them up, shake icy water from my fingers (brrrrr), haul myself back up onto the bunk, hit my head on the beam as I’m trying to slide back into the delicate configuration of sleeping bag and liner, roll over and re-arrange my things, then lie quietly. Amanda briefly ventures outside again, comes in and comments how clear the sky has now become, with a brilliant Milky Way outside. I choose to believe her, but despite my efforts I can’t make much out through the corrugated plastic skylight directly above me that’s rapidly attracting condensation. It’s a quiet night, bearable but not exactly warm. I find myself stirring at 4am for a sip of water. Groping around in the dark, I discover a thin seal of ice around the top. Hmmmm. And it’s welcome to Sunday morning. With our adjusted plan that spends Sunday on the tops instead of Saturday, we’ll have a longer than expected day today, and therefore intend to be away by 7.30am. This translates to a 6.30am wake-up, although in the emerging pattern I notice everyone except for me rustling ten minutes earlier. Well, it turns out the idea to bring the boots and socks inside was a very good idea. Unfortunately it just wasn’t quite good enough, because it turns out they’re all well frozen despite our precaution. The socks that hang on the wall are frozen. Everyone’s boots that were under the bench are frozen. The tea-bag in my cup is frozen. By this point, I’m willing to agree that there might have been something worthwhile in Amanda’s idea the previous night. We haven’t tested the tap so far this morning, however, and with all the water we saved there’s no reason to test it, so perhaps we’ll never know for certain. Stepping outside, it looks as if it’ll actually be quite sunny today. We lay out our frozen boots and socks in an attempt to thaw them in the morning sun, but it may take some time. If I’d actually believed this was going to happen, I might have made an effort to shape my boot-laces into a more artistic and symmetrical pattern. Well, breakfast perhaps. They’re not thawing out very well, and nobody really wants to try and pull frozen socks and boots onto their feet. It’ll have to happen soon, however. Application of sunblock could be a good diversion, even though for some reason I seem to be having trouble getting it out of the tube. Strange — usually this stuff flows so easily. Finally though, we do make the effort to freeze our feet, which should hopefully warm up and quickly thaw out as we begin to walk. It’s even less fun than pulling on soggy socks and boots in the morning, however. I think I have a clump of ice somewhere under my heel, and might need to do something about that later. 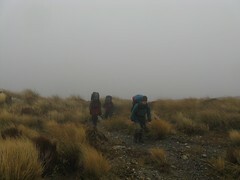 Leaving Dundas Hut on Saturday morning. 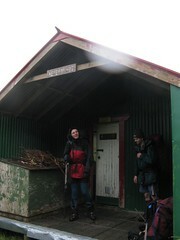 As it is, though, we close the door at Dundas Hut and leave at 7.30am, happily at the exact time we’d hoped for. It’s actually quite a climb out of Dundas Hut, especially noticeable early in the morning when getting into it so immediately. Last time I was here, I made a silly mistake of drinking far too much water which contributed to severe problems later in the day, and this time I was being much more careful. In fact, this time I’d filled up with a complete 3 litres of water which was at least twice as much as what I expected I’d probably need. Still, better to have too much than not enough if in doubt. Nearing the top of the Dundas Hut spur, I’m already feeling quite hot and sweaty in the morning sun, though this is quickly thwarted on reaching spot-height 1415 at the top of the spur after 20 minutes, where we’re suddenly hit by what remains of the light but still-freezing sou-easterly. It gets stronger as we briefly drop into a saddle below Pukemoremore, but is never threatening. Evidence of the overnight cold is all around, though, including small remaining slabs of snow, and one small tarn which is very solidly frozen on top when I test it. 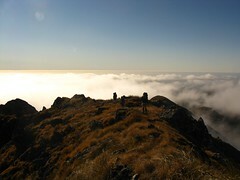 We stand on top of Pukemoremore at around 8.15am, the highest point we’ll reach during the entire weekend at 1474 metres. Early clouds on the Main Range. We carry on over Walker (or rather sidling around to the left of it), all part of a very pleasurable ridge to follow, although with the freezing breeze it makes sense to stop a few times and all of us end up wearing over-trousers, gloves and hats to keep off the threat of the wind chill. Every so often, we spot the footprints of the three people the previous day, deeply embedded in the alpine mud, and more often than not they’ve become the moulds for icy casts of their boots that are now in-set into the ground. Coasting along the ridge as wispy clouds waft over the range with the light suffix of a sou-easterly, turbulent patterns form over and under each other in seemingly chaotic patterns before disintegrating in a vapourous wash of transparency. To the west, the town of Levin is bathed in an opaque sunshine, shielded from the ravages of an overcast sky by the profile of the Tararuas, the silhouette of which right now includes our kitted out storm gear. If there’s any doubt about the point of going tramping on the Tararua main range, this should seal away any concerns because studies show that the weather affects people’s happiness and by adding to the profile of the Tararua main range, it occurs to me that we are helping to shield Levin from the dasterdly and treacherous light wind that would otherwise carry demoralising cloud over the district to the west. Somewhere out there, people are producing higher and more efficient economic outputs by working harder because they’re happier (as various studies imply), improving the economy of Levin and by extension the world. 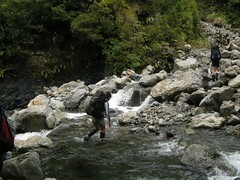 And it’s all thanks to trampers in the Tararuas. We’re happy, too. for me to hurry up and take a photo. As we pause at times, we can see as far as Mount Eggie/Taranaki, Ruapehu and Ngauruhoe in the distance. Looking out over the plains, we contemplate how they might have been as forest wet-lands, prior to European settlers arriving with their newly-invented techniques of turning the vast majority of New Zealand’s original wetlands into land that could be used for farming, but completely transforming the eco-system as a consequence. Eventually as the sun rises in the sky, the cloud that blows over the range from the east disintegrates entirely, leaving us with a completely sunny, though slightly breezy day on the tops. On reaching West Peak, we have the last climb of any significance ahead of us, since it’s here that the main range drops into a saddle about 200 metres deep between two ridges, re-commencing at East Peak on the far side — exactly 20 metres higher than the West Peak on which we stand. I bet this is treacherous in the wrong kind of weather, and perhaps it wasn’t much fun for those guys the previous day, but for us it works out okay. Overall it takes about 40 minutes to drop into the saddle from West Peak, then climb to East Peak, and we pass it by at roughly 10.45. And suddenly our time on the Main Range is almost over. Already. Because at Ruapae, we’ll be turning off and working our way back down to Herepai Hut, where we began so long ago on Saturday morning. The only concern I have from this point is a short section of ridge I remember from last time, which has slipped on both sides and which is largely held together by Leatherwood. To an extent, the thought of it has been haunting the back of my mind for much of the weekend, especially since the Department of Conservation decided to start warning people some time ago that the ridge has fallen away and it’s necessary to be very careful. Once we arrive shortly before Ruapae, however, it’s barely noticeable such that until it’s gone, I’m not even sure if we’ve passed it by. The ridge is held together by Leatherwood and it’s reasonably steep on either side, but nothing like as bad as I remembered it. So that’s good. I’ll remember for next time that I shouldn’t trust my memory, and this experience wouldn’t be the first time. And we leave the Tararua Main Range, turning off at Ruapae towards the East, over to Herepai. Half way there, we stop in a flattish place sheltered from the wind, bathed in sunshine, and have an early and lazy lunch. From here we can see the leatherwood-laden ridges to the northern end of the Main Range, not a good place to be stuck without sufficient planning. We take our time, knowing that from here it’s mostly down-hill. Through some bad coincidences of timing, this is actually the first time I’ve been able to get to the Tararua tops all year, and the first time on any tops since April. It’s been awesome. Anyway, it’s time to leave after a while, and we walk past the Stan Evans Memorial Cross on Herepai at about 12.20pm. 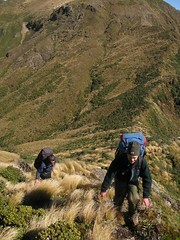 The track along this spur is tussock-laden, and it’s necessary to take care about stepping in hidden holes and such, but it’s generally easy. Within 20 minutes, we’re looking straight down to the roof of Herepai Hut, not far below, with the long upper reaches of the Ruamahanga River in the background as it flows south-ish towards Roaring Stag Lodge. Roaring Stag is hidden behind a dent in the riverbed, but from this perspective we can see roughly where it should be. It takes 15 minutes to jaunt down the steep track into the trees and reach Herepai Hut, and then we once again stretch our legs in the sunshine. Checking the hut book, it seems to three crazy guys did pass through here last night, although they didn’t leave much more information about their trip except to imply they were heading back out to the Putara Road. And this is where we were going, too, maybe in a more relaxed state. Final views of the Main Range. 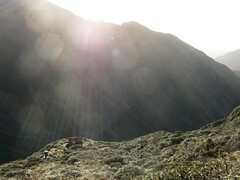 We sit in the sun at Herepai Hut for about 15 minutes, before leaving on the final leg of the weekend. From here it’s just down. It’s the third time we’ve walked along this section, and the first in the sunshine. It seems somewhat less muddy than it was yesterday morning. After an hour of walking we cross a long bridge over the Mangatainoka River, which the track follows for the remainder of the distance to the road, and from here on it’s flat. There’s a nice camp-site below the bridge, reachable from a short track that begins a minute or two from the end closest to Putara Road, and we head down for a look before finally returning to the van, a further 40 minutes away. There’s an annoying amount of mud just before the road, which nobody manages to avoid — only irritating because it complicates the act of putting boots away later, but I suppose this is part of the whole thing. Overall it’s be a very rewarding and relaxing weekend, a good thing given the ugly weather in the beginning, but now it’s all paid off. 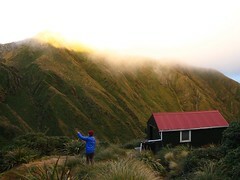 This entry was posted in tramping and tagged bagged:cattle ridge hut, bagged:dundas hut, bagged:herepai hut, bagged:roaring stag lodge, rivers, tararuas, tramping, wellington tramping and mountaineering club. Bookmark the permalink. sweet, sweet photos and sweet, sweet blog. it’ll be useful for future tramps, for sure!